“Ohhh! Does she cry?” asks a musician, watching Kirk on TV in a hotel room. “No, big girls don’t cry,” responds his band mate. A “jukebox musical” often uses a contrived setup to play a famous song. In this case, it’s the truth. If you’re an American, you’ve already guessed this is how The Four Seasons’ hit “Big Girls Don’t Cry” came into the world. 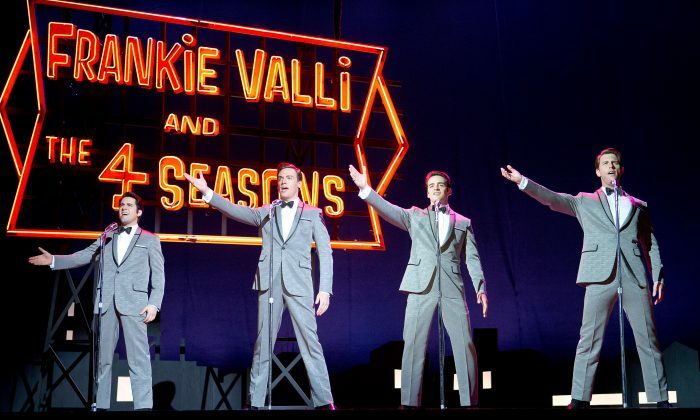 Clint Eastwood’s new movie, “Jersey Boys,” is about the very Italian-American life and times of Four Seasons bandleader Frankie Valli, his close friend Tommy, and the rest of Frankie’s semi-juvie friends. Most of whom are in the band. A barbershop in Belleville, New Jersey. Gyp DiCarlo (Christopher Walken), a local mobster, is having himself a shave. Young Francis Castelluccio (John Lloyd Young) will do the shaving honors. It’s his first time. Gyp’s taken him under his wing, you see. Frankie’s in a band. Buddy Tommy’s on guitar, and Nicky’s on bass. This kind of harmonizing variety trio was what people wanted to hear in 1951. This kid Frankie—he’s got a voice! When he sings, it moves Gyp to tears (which, because it’s Walken, is funny). But ’round about 1960, nobody’s hiring trios anymore. They need to evolve, so Tommy finds a talent scout named Joe Pesci (yep, that Joe Pesci). And Pesci finds them a fourth member, Bob Gaudio, writer of songs. What to do about a band name? While they’re standing outside a bowling alley called the Four Seasons, its sign goes haywire, lights flickering on and off. It’s a sign. From a sign. Agents are landed, contracts signed, fame waxes. And wanes. Ironically, in the waning phase, it’s learned that Tommy’s into a loan shark named Waxman. For $162,000 large, plus an extra half a mil to another source. Tommy’s hustler personality may have ultimately gotten them off the ground, but it also threatens to grind them back into it. Nicky eventually quits due to Tommy’s compulsive need to use every last towel in a hotel suite having gotten on his last nerve. Tommy also dishes dirt to a reporter about Frankie. And yet Frankie, faithful to the end, winds up playing 200 dates a year in the polyester ’70s in cheap hotels and dive bars, while countertop roaches stroll by his coffee cup. All to cover Tommy’s massive debt. Talk about a friend in need. Based on the hugely popular Broadway musical of the same name, the movie version borrows the “breaking the fourth wall” theatrical device (actors speak directly into the camera to tell their stories), which emphasizes the homey, bygone feel of American neighborhoods, where everyone knows everybody else’s business. John Lloyd Young and all band members selected were hardworking actors from the Broadway shows, with hundreds of performances’ worth of experience in these roles under their belts. Young has 1,400 performances, to be exact. It shows. They are stellar. The mob-tinged lingo, accents, and body language are dead-on. They don’t walk or talk that way in person. Female roles are few and far between, with only the actress playing Frankie’s wife getting more than a couple of lines. Eastwood’s daughter Francesca Eastwood plays a waitress. Women’s roles are classically missing in movies about macho men. The other thing missing is that, when Clint pays tribute to the stage musical with an all-cast dance number, he should have let legendary (yet few know this) song-and-dance man Christopher Walken do a nice soft-shoe. All while dispersing Walken-isms. He should’ve let the Saint of Strange Syntax combine his musical and cinematic talents in one instantaneously YouTube’d classic. Oh!